Glaeser travels through history and around the globe to reveal the hidden workings of cities and how they bring out the best in humankind. Even the worst cities-Kinshasa, Kolkata, Lagos- confer surprising benefits on the people who flock to them, including better health and more jobs than the rural areas that surround them. Glaeser visits Bangalore and Silicon Valley, whose strangely similar histories prove how essential education is to urban success and how new technology actually encourages people to gather together physically. He discovers why Detroit is dying while other old industrial cities-Chicago, Boston, New York-thrive. He investigates why a new house costs 350 percent more in Los Angeles than in Houston, even though building costs are only 25 percent higher in L.A. He pinpoints the single factor that most influences urban growth-January temperatures-and explains how certain chilly cities manage to defy that link. He explains how West Coast environmentalists have harmed the environment, and how struggling cities from Youngstown to New Orleans can -shrink to greatness.- And he exposes the dangerous anti-urban political bias that is harming both cities and the entire country. 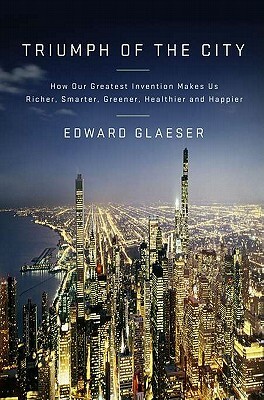 Edward L. Glaeser is the Fred and Eleanor Glimp Professor of Economics at Harvard University. He studies the economics of cities, housing, segregation, obesity, crime, innovation and other subjects, and writes about many of these issues for Economix. He serves as the director of the Taubman Center for State and Local Government and the Rappaport Institute for Greater Boston. He is also a senior fellow at the Manhattan Institute. He received his Ph.D. from the University of Chicago in 1992.